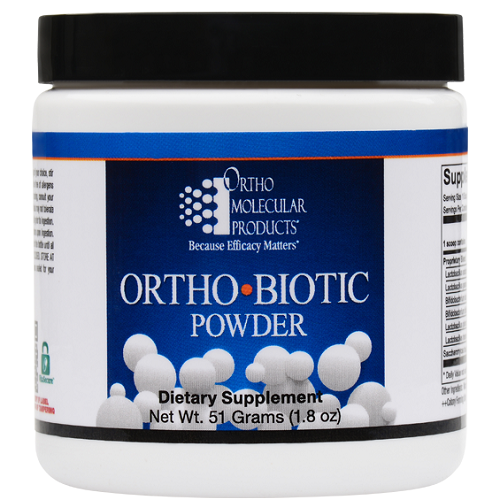 Ortho Biotic Powder includes a carefully assembled cast of probiotic organisms to support microflora balance and maintain a healthy environment for vitamin uptake and optimal immune function. 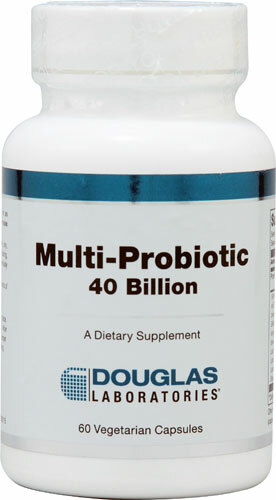 The Ortho Biotic line of probiotics is our #1 selling product - selling better than all of our other probiotics combined! It is invaluable for certain GI disorders. I could never swallow as many pills as I need of this friendly bacteria, so I am grateful that it comes in a powder form. My doctor, who is very serious about holistic medicine, checked out this product and company very carefully and rates it a high quality product. As for my own GI problems, it has solved an enormous dysfunction, and allows me to live an almost normal life. Since there is very little useful data on the use of friendly intestinal bacteria, one must simply experiment with it to see if it helps their own GI problems. Other Ingredients: microcrystalline cellulose and silicon dioxide. Formulated to be free of: gluten, corn, artificial colors and flavors. Adults: Add one scoop of Ortho Biotic Powder (1.7 g) to a glass of water or the beverage of your choice, stir and drink, or as recommended by a healthcare professional. Add one scoop (1.7 g) to a glass of water or the beverage of your choice, stir and drink, or as recommended by your health care professional. Ortho Biotic is a unique probiotic formula designed to deliver active organisms shown to promote healthy gut flora, protect intestinal integrity and boost immune function. 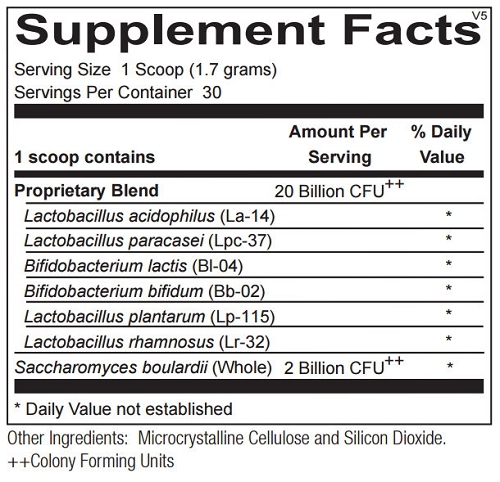 Included in this formula is Saccharomyces boulardii, an extensively researched microorganism shown to help restore microflora balance by enhancing commensal organisms. Each scoop of Ortho Biotic provides seven proven probiotic strains chosen for their ability to withstand the harsh gastrointestinal (GI) environment and adhere to the intestinal tract, and deliver superior results. Ortho Biotic is also available in capsules at the same high concentration for those who prefer capsule delivery. Add one scoop (1.7 grams) to a glass of water or the beverage of your choice, stir and drink, or as recommended by your health care professional. Wheat, gluten, soy, corn, animal or dairy products, fish, shellfish, peanuts, tree nuts, egg, artificial colors, artificial sweeteners or preservatives. 3. Bendali F, Madi N, Sadoun D. Beneficial effects of a strain of Lactobacillus paracasei subsp. paracasei in Staphylococcus aureus-induced intestinal and colonic injury. Int J Infect Dis. 2011 Nov;15(11):e787-94. 4. Chiang SS, Pan TM. Beneficial effects of Lactobacillus paracasei subsp. paracasei NTU 101 and its fermented products. Appl Microbiol Biotechno. 2012 Feb;93(3):903- 16. 5. Danisco. Lactobacillus paracasei Lpc-37 probiotic identity card. 6. Singh A, Hacini-Rachinel F, Gosoniu ML, Bourdeau T, Holvoet S, Doucet-Ladeveze R, Beaumont M, Mercenier A, Nutten S. Immune-modulatory effect of probiotic Bifidobacterium lactis NCC2818 in individuals suffering from seasonal allergic rhinitis to grass pollen: an exploratory, randomized, placebo-controlled clinical trial. Eur J Clin Nut. 2013 Feb;67(2):161-7. 7. Lewis MC, Patel DV, Fowler J, Duncker S, Zuercher AW, Mercenier A, Bailey M. Dietary supplementation with Bifidobacterium lactis NCC2818 from weaning reduces local immunoglobulin production in lymphoid-associated tissues but increases systemic antibodies in healthy neonates. Br J Nutr. 2013 Oct;110(7):1243-52. 8. Schoster A, Kokotovic B, Permin A, Pedersen PD, Bello FD, Guarabassi L. In vitro inhibition of Clostridium difficile and Clostridium perfringens by commercial probiotic strains. Anaerobe. 2013 Apr; 20:36-41. 9. Chytilová M, Mudroňová D, Nemcová R, Gancarčíková S, Buleca V, Koščová J, Tkáčiková L. Anti-inflammatory and immunoregulatory effects of flax-seed oil and Lactobacillus plantarum - Biocenol™ LP96 in gnotobiotic pigs challenged with enterotoxigenic Escherichia coli. Res Vet Sci. 2013 Aug;95(1):103-9. 10. Evard B, Coudeyras S, Dosgilbert A, Charbonnel N, Alamé J, Tridon A, Forestier C. Dose-dependent immunomodulation of human dendritic cells by the probiotic Lactobacillus rhamnosus Lcr35. PLoS ONE. 2011 Apr 18;6(4):e18735. 11. Rodrigues AC, Cara DC, Fretez SH, Cunha FQ, Vieira EC, Nicoli JR, Vieira LQ. Saccharomyces boulardii stimulates sIgA production and the phagocytic system of gnotobiotic mice. J Appl Microbiol. 2000 Sep;89(3):404-14.